Convertir doc - Conversion Ficheros. 'Convertir Doc' es una utilería de conversión de documentos sofisticada y además, fácil de usar. Convert HTML to DOCX easily with Softinterface tools. Click the links above to get specific directions on how to use 'Convert Doc's user interface or command line. Need to convert HTML to DOCX files? If so we've got an excellent software utility you've never tried, till today. 'Convert Doc' is a simple, yet sophisticated document conversion tool. 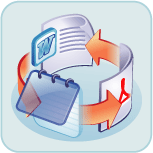 Convert to and from DOCX, DOC, HTM, RTF, PDF, TXT etc. NOTE: This program does not require any other software to be installed for it to work. Below we discuss how to use the programs user interface and command line interface to specifically convert HTML to Word files. Both methods allow you to automate your conversion needs easily. The user interface has a built in scheduler, and 'Convert Doc's command line (or COM/ActiveX interface) can be used with batch files or your programming language. NOTE: DOC and HTML conversion is only one of several things this tool can do. To learn more about 'Convert Doc's complete functionality visit the 'Convert Doc' home page. To convert HTML to DOCX using the programs user interface you can follow the directions below. 2. Select the 'Convert Doc' conversion method (Or the 'MS Word' conversion method) and select your input file. If you are converting a whole folder of HTML files, select the folder and specify all the files within it. For example to convert all the files in the folder "c:\My Files\" set the input file to "c:\My PDF Files\*.HTM". Note the use of the asterisk "*" character which is required when specifying a whole folder. Next select the Input File Format (e.g. DOC, TXT, RTF, HTML etc) which in this case is HTML. 3. Specify the output file path and name. If you are doing a whole folder specify the output file with the asterisk "*" in the name. For example "c:\My Output Files\*.DOCX" is properly specified. Specify the file type to convert to by choosing the "Convert To File Format" which in this case is DOCX (can also be DOC, RTF, HTM, TXT, RTF). 4. Click the CONVERT button on the tool bar to start converting. 2. Select the 'Convert Doc' conversion method (or the 'MS Word' conversion method) and select your input file. If you are converting a whole folder of DOCX files, select the folder and specify all the DOCX files within it. For example to convert all the files in the folder "c:\My Files\" set the input file to "c:\My Files\*.DOCX". Note the use of the asterisk "*" character which is required when specify a whole folder. Next select the Input File Format (e.g. DOCX, DOC, TXT, RTF, HTML etc), which in this case is DOCX. 3. Specify the output file path and name. If you are doing a whole folder specify the output file with the asterisk "*" in the name. For example "c:\My Output Files\*.HTM" is properly specified. Specify the file type to convert to by choosing the "Convert To File Format" which in this case is HTM (can also be DOC, HTM, TXT, RTF, PDF). When you click the ADD button, a 'Conversion Item' is added to the 'task list' at the bottom of the user interface. You can add as many 'conversion tasks' as you want, and save the 'Conversion Job' file for use at a later time. See the File menu for saving and restoring 'Conversion Jobs'. 'Convert Doc' can be especially useful if you require complicated file conversion jobs done on a regular basis. By saving and recalling a conversion job file, 'Convert Doc' quickly remembers all the file conversion tasks and their details. Press the F8 key while running 'Convert Doc' to schedule the running of a 'conversion job'. It is the best file conversion tool you've never used... till today! Click here to download and try it out for free. Click here for full documentation. NOTE: 'Convert Doc' can be used simply with the graphical user interface (GUI). If you've never heard of 'Command Line' before, we would recommend not reading this section and instead download and try the software. 'Convert Doc' can be run without a user interface with command line arguments much like in the good old DOS days. Alternatively you can initiate command line execution by going to the operating systems 'command prompt' or within Windows at the START-RUN menu and typing it in there. Lastly, the command line interface can be used from Batch files (files with *.BAT extension). Items above enclosed in square brackets “[ ]” are optional, all other ‘switches’ are required. Therefore /J should always be specified on the command line. The /V switch is used to have 'Convert Doc' report the status of the conversion. It is highly recommended you use the /V switch when you are first developing your command line. Specifying a 'Conversion Task' is a bit more tedious, but does not require the prior creation of a 'Conversion Job' file. However, because the documentation contains a comprehensive list of examples, it should be a simple matter of finding the example that matches your needs, and modifying the paths to the input and output files. NOTE: This is just a sample from the documentation. If you have trouble running these examples please see Helpful Hints For Creating a Command Line within the documentation. Also, by looking at the documentation, you'll see the full list of options/switches available. The /S and /T switches above specify Source (input) and Target (output) path respectively and are both required when converting a single file. It is always a good idea to use double quotes around the path especially if there are space characters within the path. The /M2 switch tells ‘Convert Doc’ to use the ‘Convert Doc’ method (it is one of 3 different possible conversion methods). /F4 is the input file type, which in this case is a HTML file. Looking up the file types within the File Type Constants Specification for the ‘Convert Doc’ method will show that the numeric value of 4 corresponds to a HTM file. /C9 is the output file type, which in this case is a Word DocX file. Looking up the file types within the File Type Constants Specification for the ‘Convert Doc’ method will show that the numeric value of 13 corresponds to a DOCX file. Finally, the /V (for Verbose) switch is used to give instant feedback by having the program report the status of the conversion with a message box. You can remove this once you have perfected your command line specification. You can also (or instead of /V) create a Log file that will contain the results of the conversion by using the /L switch. Note: It is highly encouraged that you use the Verbose (/V) switch initially to see what the status of your conversion is and to help you perfect your command line. When in verbose mode the program will tell you what went wrong or right with your command line using message boxes. To convert all the HTM files in the D:\ToDo\ folder to DOCX files in the same directory, the following syntax would be used. To extend the previous example (immediately above) to convert all subfolders within D:\ToDo\ simply add the /R switch.